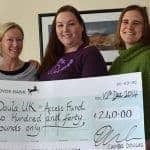 Doula UK was founded in 2001 to promote life-changing support from skilled doulas for families in the childbearing year, to nurture the doula community by mentoring and supporting our members, and to give confidence to parents and professionals, while advocating for better support for UK families. We are now a community of more than 700 birth and Postnatal doulas, supporting thousands of births, and providing many more hours of postnatal support to families each year. On completion of a Doula UK Approved Preparation Course, new doulas join Doula UK as Mentored Doulas*. Our flagship Mentoring Scheme was established in 2004, to ensure that each new member is supported through a unifying Recognition process, regardless of the Preparation Course they have completed. When the Doula Mentor is happy that a Mentee is ready, the member becomes a Recognised Doula. The Doula Mentor’s role is to support and discuss the Mentee’s work and experience, and to make time between each job to assess the work submitted by the doula, and to discuss this with her. The Mentee must take ownership of the process in terms of contacting the DM to arrange the debriefs. The Doula Mentor gets to know her Mentee through an in depth conversation, beginning with a discussion around the Mentee’s aide-memoire (a sort of Q&A about their personal path to doulaing). The DM also offers constructive feedback on the doula’s doulaography (Doula UK profile) and website, and encourages her to actively participate in the Doula UK community, by joining her local Facebook group for example, and connecting with her Doula UK Rep. The new doula may be ready for her final interview when she has completed a range of experiences including the accompanying work, debriefing, discussion and reflection to the DM’s satisfaction. The DM will only charge for four debriefs, regardless of how many jobs are completed as part of the recognition process. The Mentee pays the DM directly; £40 per debrief (up to a maximum of £160) and £40 for the final recognition interview, regardless of how many jobs it takes for your DM to feel that the Mentee has experienced a range of situations and is ready to be a Recognised Doula. New doulas therefore need to budget for £200 to become a Recognised Birth Doula, and/or £200 to become a Recognised Postnatal Doula. Members may choose whether to become Recognised as either a Birth or Postnatal Doula, or both. There is no obligation to do both, and many doulas choose to do only birth or only postnatal work. Some new doulas will complete their recognition within a few months of joining Doula UK, but a year or so is more typical. Like any new venture, the speed at which milestones are reached will depend on different factors. Some new members continue in other jobs and doula when they can. Others, with young children or other caring commitments, may also take time to complete their Recognition. Members who make doulaing their primary focus from the outset of course tend to complete the Recognition process sooner. The Doula Mentor (DM) is there to support and guide the new doula in an effective exploration of her role through debriefing, discussion and reflection on the work she has undertaken. The DM will aim to aid the new doula in her progression towards being the best doula that she can be. carries out all work within the boundaries of confidentiality. Karin Chandler completed her Doula Preparation Course with Conscious Birthing in September 2015. Karin began working towards Postnatal Recognition with her Doula Mentor, Nicola Goodall, in March 2016, and was Recognised in May 2017. Karin is now a Recognised Birth and Postnatal Doula. Nicola made me feel supported and listened to throughout the whole process. I knew that she was a safe person to go to explore issues that I might find difficult. I felt the breadth of her wisdom and experience. She was great and generous with her time, which is one of the reasons I chose her. She was incredibly organised when we debriefed and had a fab e-booking system. She clearly re-read all my notes just before we debriefed and was therefore totally prepared for our conversations. We had lots of in between chats via Messenger too. My understanding is that the process is to help me reflect and develop my doulaing, learning from experience and realising my strengths as well as areas to be developed. I am definitely more confident and more aware of postnatal traditions, such as belly wrapping. We had some interesting conversation about cultural appropriation and inclusivity too. She was great and has inspired me to aim to become a Mentor one day. This member (who wishes to share her experience anonymously) completed her Doula Preparation Course with Nurturing Birth in October 2011. She began working towards Birth Recognition with her Doula Mentor, Alison Edwards, in April 2016, and was Recognised in July 2017. Alison was very relaxed and clear, and made [the process] sound very easy and positive. Alison was very often available and offered me support when needed. We worked around our busy schedules to make it work. She never rushed me through, and was very understanding. She helped me a lot. Alison is an amazing doula and Mentor and I’m so happy that I’ve found her to help me becoming a Recognised Birth Doula. She was easily available and always made it clear when to call her. She always nearly instantly replied to my texts/emails which was amazing. She always made some time for me when needed. Everything was explained to me very clearly it was an easy and clear process. For me the mentoring process helped me reflect on each of the births I attended, helping me gain some invaluable experience, getting more confident as a doula – a very positive process. The Recognition process helped me becoming a better birth partner/ doula teaching me how to support a variety of births, families and women. It taught me that no woman/family is the same and that we don’t ‘click’ with everyone and that’s okay. It helped me become more confident and gain experience from someone who is already very much into doula work. Carly Harding-Jones completed her Doula Preparation Course with Birth Bliss in November 2016. Carly began working towards Postnatal Recognition with her Doula Mentor, Zara de Candole, in January 2017, and was Recognised in September 2017. Zara made me feel positive, welcomed and confident in my ability to get through the mentoring process. She was assertive and informative when I asked questions and voiced my concerns over balancing the process with my own life and family. I walked away without doubt that Zara and I were meant to be together through my mentoring period. If I had an issue she’d give me a bell back or a text swiftly to ask if I was okay, what’s up? On some occasions during this process she went above and beyond giving me time where I was suffering. I knew about the paperwork and I understood why I was about to embark on the mentoring journey. She stated at the start she was there ‘if you have a wobble’ and indeed she was on many occasions without questions. I was aware that I would be needing some support as I approached a job that at the beginning I had very little idea of how it would work with finding clients, interviews, what would be expected of me. Zara put me at ease through all of this. Including numerous conversations about insurance, rates and what I could offer as a doula. Zara was encouraging on many levels, she provided all the details I needed to put my business in place but she also gave me reassurance of what I could offer as Carly. I never doubted that if I needed her assistance with something that I could call on her for all the right words. Zara always used open questions to help me explore my own answers and in return it gave me a lot more fulfilment. A lot of my journey involved confidence and self-belief, I’m not sure I would have been able to get to this point without Zara’s support.